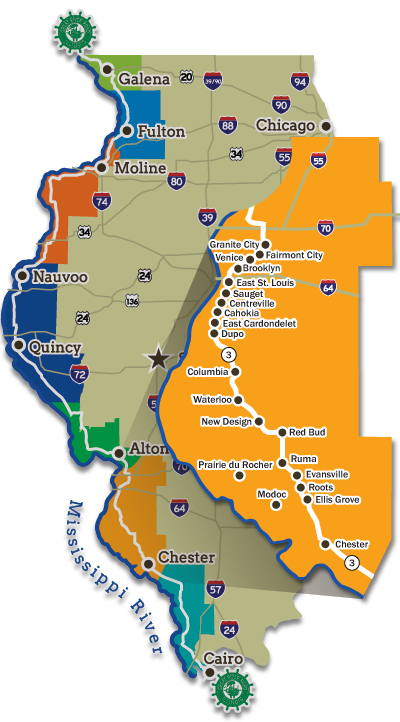 Find yourself in one of our 19 Southern Illinois counties. We offer great family friendly attractions, historic sites, restaurants, shops, wineries, and lodging. ILLINOISouth, known for outdoor recreation, is home to many state parks and numerous beautiful lakes creating ample spaces for fishing, boating, and hunting. Additionally, several miles of trails for bicycling and hiking can be found throughout the region. See the largest prehistoric site in North America at Cahokia Mounds, discover the birthplace of Popeye, or feast your eyes on the World's Largest Catsup Bottle - you'll be surprised by everything ILLINOISouth has to offer.